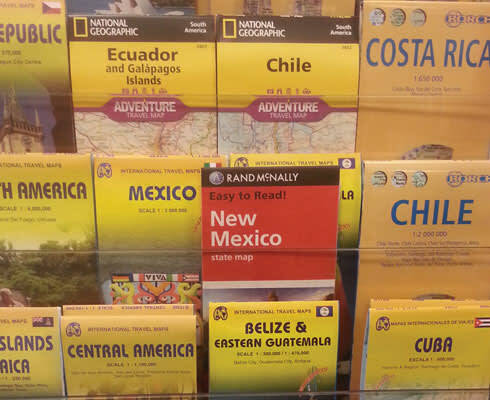 While browsing through his local chain bookstore in Fort Myers, Florida, Kevin Irons spied this misplaced New Mexico map, stopped in his tracks, and laughed aloud. This past June, Manuel Florez and his wife traveled to Normandy, France. The memorable trip was made more so by an incident at Charles de Gaulle airport. At one of the many stations where they had to produce passports, a woman directed travelers to the correct lines to obtain boarding clearance receipts. “I showed her mine,” Florez says, “and she gave it a slow, careful look. She then looked at me and said, “Artesia, New Mexico, is an interesting birthplace—is it close to the equator, near Central America?” He couldn’t help but laugh, and explained that New Mexico is located in the U.S. between Texas and Arizona. In an end-of-year roundup of 2015&apos;s best recipes for all U.S. states, Betty Crocker’s December newsletter jumped from New Jersey to New York, leaving New Mexico out of the mix. After disgruntled home cooks complained, New Mexico was added ... with a recipe for “Three Ingredient Lemon Loaf.” The last time we checked, lemon loaves were no staple of New Mexico cuisine.